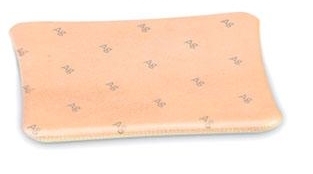 Allevyn Ag Non-Adhesive Hydrocellular Foam Dressing is indicated for exudare absorption and the management of partial to full thickness wounds. Typical wounds treated with this product include venous ulcers, arterial ulcers, diabetic ulcers, pressure sores, donor sites, surgical incisions, surgical excisions, and 1st and 2nd degree burns. It provides the creation and maintenance of a moist wound environment. Moist wound environments have been established as optimal environments for the management of the wound. Allevyn Ag Non-Adhesive dressing provides separation between the wound and external environments to assist in preventing bacterial contamination of the wound. Allevyn Ag Non-Adhesive Border dressing provides optimal exudate management. They come in an easy to use range of dressing sizes and can be left in place for up to 7 days depending on the nature of the wound and the level of exudate present. The feature a breathable film top, foam core, non-adherent wound contact layer and profiled edges. This dressing reduces the risk of excess fluid at the wound site and excess wound fluid is transpired away more quickly. They promote rapid wound closure, reduced risk of maceration, less potential for leakage and odor, and longer wear times. Allevyn Ag Non-Adhesive reduces bacterial load (in-vitro). It removes some barriers to healing allowing the host to regain control and progress the wound to closure. They are easy to apply, can be removed in one piece, and are designed in shapes and sizes appropriate for target wound types. The top film switches to become more breathable in the presence of fluid, therefore it responds, when the clinician needs t most. It provides an effective barrier to bacteria penetration and is waterproof. Dressings are conformable and comfortable and include a low allergy adhesive. Provides absorption capacity for up to 7 days(Allevyn Ag Sacrum up to 5 days) and protects from leakage. Maintains a moist wound environment and prevents healing tissue from growing into the dressing minimizing pain on removal. -Allevyn Ag Non-Adhesive is not compatible with oxidizing agents (e.g. EUSOL) or hydrogen peroxide, as these can break down the absorbent polyurethane component of the dressing. -Allevyn Ag Non-Adhesive dressings are not intended to provide treatment for infected wounds. -Allevyn Ag Non-Adhesive may be used on infected wounds being managed in accordance with institutional clinical protocols for infection abatement as an adjunct to the standard treatment regimen to provide a barrier to bacterial protection. -Allevyn Ag Non-Adhesive may not be compatible with topical anti-microbials. -Reddening of the skin around the wound may be observed. This may be related to irritation of fragile skin or wound exudate remaining in contact with normal skin for prolonged periods of time. If reddening or sensitization occur, discontinue use. -When Allevyn Ag Non-Adhesive is used on a patient during MRI (Magnetic Resonance Imaging) examination some warming may be experienced. -Allevyn Ag Non-Adhesive is not compatible with oil based products such as petrolatum. -Allevyn Ag Non-Adhesive is not suitable for use on cavity wounds but may be used over cavity wounds as a secondary dressing.